Discussion in 'The Garage' started by Bushyeyed1, Nov 25, 2018. I would like to say the battery is good since I just bought it when I got the bike. You might want to take it somewhere and have it load tested. I think most auto parts stores will do that for free. New doesn't necessarily mean good, lol. Or you might trickle charge it on the bench, let it sit there a few days, then check it to see if it still has a charge. You could also test it by clipping a 12v bulb to the terminals. Does doing that knock the charge right out of it? Fair enough... just keep in mind even new stuff can go bad. If you got a AGM batt.... I read recently that the main cause of AGM failure is getting below 50% charge. At 5V... you blew through that limit. Assuming the batt is good, take all the connections apart and clean them... stator connector. Reg/rec conn. Batt + terminal... and gnd terminal. The bikes 40 yrs. old.. not unusual for corrosion causing elec. problems. What reg/rec do you have? So the past few times I trickle charged it to get it up in the 12 volt range before the ride. The battery does hold a charge while sitting and doesn't draw that much with just ignition on and no headlight yet. I have the stock reg/rec and I did take off all connectors and check for corrosion after the first time it shut down. This is the battery I got (https://shop.advanceautoparts.com/p/autocraft-power-sport-battery-14l-a2/2090120-P) and it looks like I can get a free replacement since it isn't 3 months since I purchased it. My new agm drained when my rotor failed on my 77 back 8 years ago. Would get above 12volt with trickle charge, but as soon as a load would get to it, it would just drop right down to nothing. Got $10 bucks for in when I traded it in for a new one. I swear if it is as easy as a battery change then I owe you guys a beer. They are not like a deep cycle battery, once they go down....game over! That's not an AGM batt.... but it still could be bad. Take it in and have it load tested. Did you take the batt. gnd. wire off the frame and clean it? I did clean the ground connector on the battery when I installed it. And it is probably a cheap battery that I just got because it was the only one they had at the time. I will take it in for a load test. I did look at the ground on the top motor mount the other day and wonder where it was supposed to go maybe I should check that it is in the right position now we are talking about ground. I did clean the ground connector on the battery when I installed it. Mailman, Superjet and Bushyeyed1 like this. You cannot ground to the battery box because it is rubber mounted. Ground was good on battery clean both sides and reads 0.00 ohms. Voltage on battery is actually at 11.87v. Taking it to advance to have them load test it. Superjet and Jim like this. Battery passed load test. I haven't looked at my wire diagram yet but the positive side read 1.something ohms to ground. Could this be a short or should I be getting some ohms to positive? 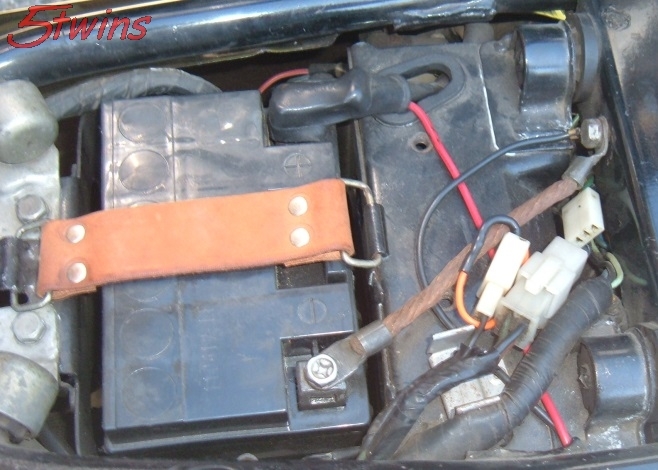 With the + lead disconnected from the batt and the key off, you should show an open (infinity) from the pos. batt lead to ground. Thats what I thought just making sure. I was an aircraft electrician years ago just knocking the dust off, lol. Not gonna rule it out because I can't go for a ride in the rain, but I did reposition the ground wire on the black box. Not sure if it was my multimeter playing with me because I was getting resistance then wasn't and couldn't duplicate. Changed the battery in the multimeter for shits and giggles. I am going to go and and start the other resistance checks and see what they come up with. How about this the little magnet has a small hole in it?